Any well thought of title of an act of human creativity is probably the most significant combination of words both in terms of font size and information density. The recent deluge of newsprint on traffic incidents might colour the perspective of any unsuspecting reader of this blog. As an honest a sincere human being,I shall crush herein any feeling that this post is moral lecture on the need for traffic rules. This post is a stripped down recollections of my misadventures on my new bike the bullet classic. Misadventures I shall live to rejoice. Its been eight months since I have started calling Hyderabad my home. Coming from the mouth of a person who spent the last seven years of his life in hostel, home usually refers to the geographical coordinates wherein we take shelter during our holidays. But the end (or pause only time knows) of my student days means that this definition of home needs to be restored to the original dictionary meaning of the word.The reason as to why I am saying all this seemingly unrelated nonsensical things is to drive home my point that I know I live in the city which I call home not just during my holidays. Being a novice in riding bikes and having a burning desire to master the art of riding catalyzed by availability of one of your friends bike usually results in the obvious. 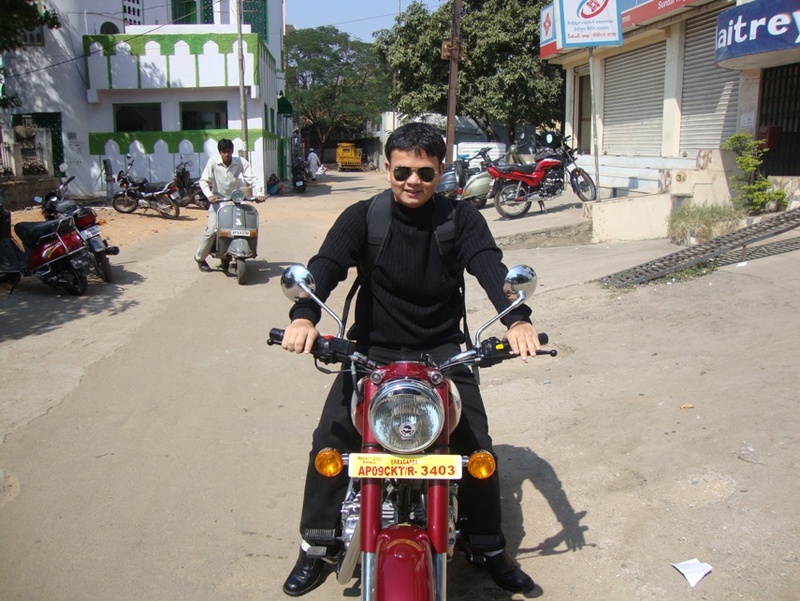 Over the last three or four months, I found my mind and body struggling with a bike in around the roads of Hyderabad. Unfortunately two of the best roads in Hyderabad outer ring road and PVNR are closed to two wheelers.So, I had never touched them. One thing led to other and experience taught me that are only two rules that apply on Hyderabad roads – physics and economics :D.
Having finally graduated to a intermediate biker, I decided it was time to buy my own. So, it was time to select my beast, after a lot of deliberations it was decided that thunderbird it shall be but a test drive of classic and a case of blinded by pure awesomeness meant that it shall be bullet classic. My first date was set as 23rd December but fate had a mind of its own. Some political agitations, tax saving investments, trip to Assam meant that I could lay my hands on my beast on 30th January. My first day on this bike saw me falling for one of Adams apple in the garden of Eden Putting all my apprehensions in the burner and aspirations on fire, I zoomed ahead in front of the by-standing white-shirt, khaki trousers, white helmet clad people. A few hundred metres later I found myself that I was not the only person exhibiting one of the most frequent examples of control system engineering, several unstable creations of human engineering were moving ahead. These repeated sightings annihilated whatever remained of the ashes of my apprehensions. It is said that pride is a vice to be abandoned and humility is a virtue to be embraced. The sight of all other that was moving on around me made me abandon my lessons on morals accumulated over the years. I could help looking down at all that was sharing the road I was traveling while the other moving objects had their heart and soul in the pages of boring science mine had the mind in science and heart in the labyrinth of the Vincis and MichealAngelos. As for the ride or should I say the flight, it was great but forbidden fruit was a touch over rated. The flight of my senses was cruelly punctuated by the section of roundabouts and work in progress.But it did feel great and letting the bike take control.With a bullet classic, you need not tell it where to go, it understands your heart. Next day, my indulgences in global warming saw me take to the Hyderabad-Bangalore Highway. Ooo! La La OMG !OMG!. Miles and miles of riding paradise. The music of my bullet piercing the night air that enveloped all my senses. The the flight of photons ,forever perplexed by the need to satisfy Einstein and Maxwell, on the asphalt road and my dashboard was a sight to behold. Funnily though the most exhilarating feeling was one of the most trivial parts of the beat.The efforts the springs on my seat that insulated me from all variations in altitude of the road that lay beneath my beast. All good things come to a pause with a promise to visit some time later. Before long,it was time for me to turn back and head to the place I sleep and have my breakfast. In this leg of my journey, I thought of killing the miles that lay between the airport and my home through the not so glamorous neighbour of PVNR. But sometimes fate smiles on you.There was nobody to block my illegal entry into PVNR. No sooner had I verified it,it was time to do a u turn and head for the asphalt pastures that lay ahead.Some man made curves can surely compete with carnal curves for the affection of man. The guilt soaked ride was an experience in itself but the punctuations inflicted by four speed-breakers in the eleven km stretch of elevated expressway did leave a bitter after-taste. 😀 . I guess that is what happens after traveling 60 kms without a bump on the Bangalore-Hyderabad nh-7.